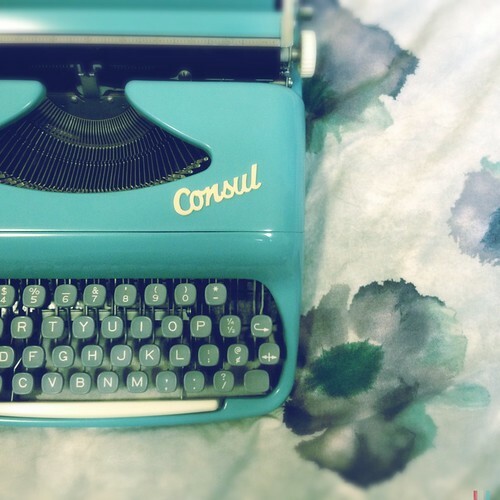 This is the portable Consul 232, light aqua blue. A purchase I probably shouldn't have made but you can read about it in the typecast. It's definitely eye-candy, the super model of my bunch. I'll include more of a review below. Firstly, I should type up my criteria for reviews of all my typewriters at one point as a page (I'll work on that). 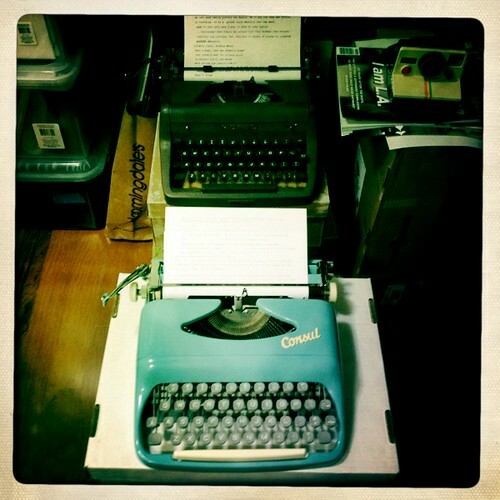 But mainly, I'm looking for the perfect typewriter. 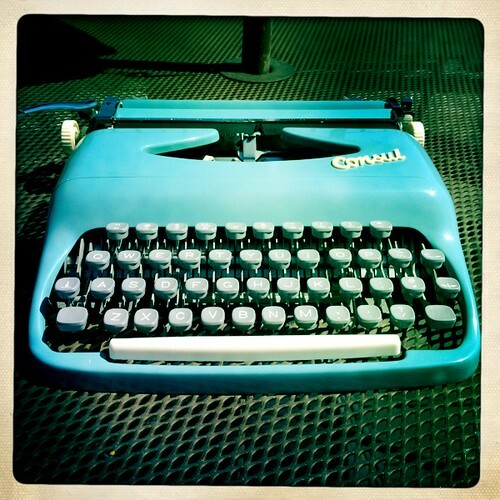 Of course this is subjective, so really it's a search for the perfect typewriter for me. I'm not a real collector since I do not look for collectibles of the antique variety which I'll categorize as the pre-war machines (at least not yet), but I'm a journeyman in the vintage type, which I'll categorize as post-war ones. Collecting was really a by-product of this search. The main objective of the search was to get me to write again, write more, and more consistently. 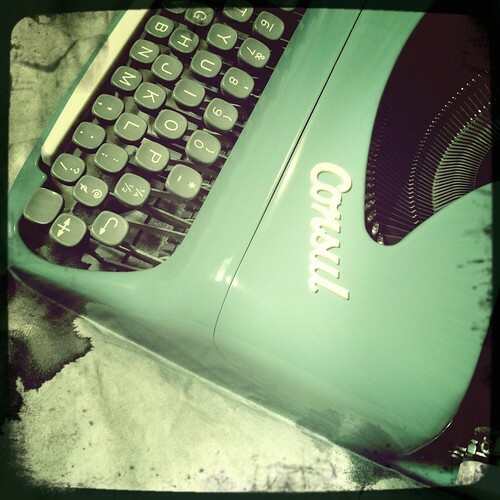 I had suffered a long writer's block, one that spanned a few years. This was the longest drought I had ever experienced. I thought I needed something to entice me to sit down and write again. When I was at the desk, I could write (mostly), but getting me there and committing the time was getting harder and harder. I had adopted various tricks, mostly all self-deceits, but many of it worked. In 2010, I decided that a typewriter may just be the right "toy" to get me at the desk since a year or two delving into fountain pens seemed to run it's due course. During one odd night of insomnia, I wondered if old Selectrics were still around. I had always wanted one as a child. I checked on Craigslist that night and found one. I emailed the seller and got a response the next morning, and owned it by the afternoon. 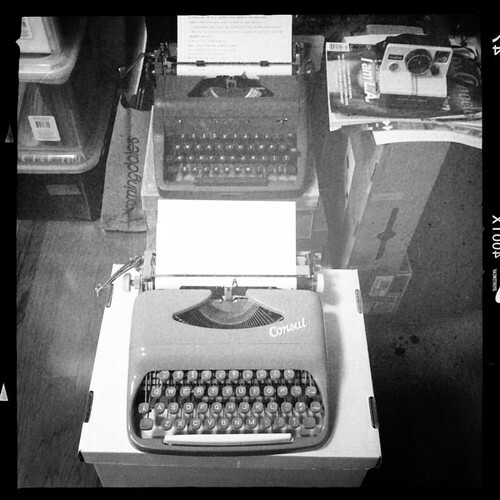 This idea and the typewriter worked well for me, but then I started wondering about manual typewriters and started looking it up on the internet and ebay. That's how I got hooked and the obsession started. 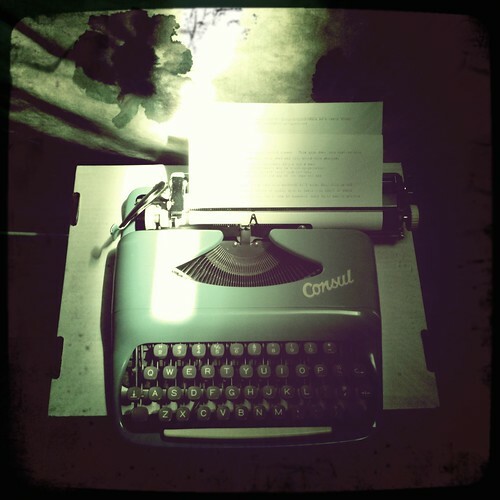 I like the relationship with a typewriter. It brings me back to how I started writing (or maybe just of my youth) and I had forgotten the interaction one has with the machine. I feel it responding back to me as a writer with it's clacking, as if we are trading bars in music, improvising in jazz. It is tactile and responsive, both I found missing on the computer (and I went through a whole keyboard searching phase also!). When you're on a mental role, and you hear your typer clacking loudly and speedily behind you as if it's chasing you, it gives the writer in me a little excitement and momentum to keep pushing forward at an heightened pace. I forgot about this feeling. I don't get this from a computer. And besides, the computer screen was giving me brutal eyestrain. Anyhow, that is a little backstory to my typewriter addiction. 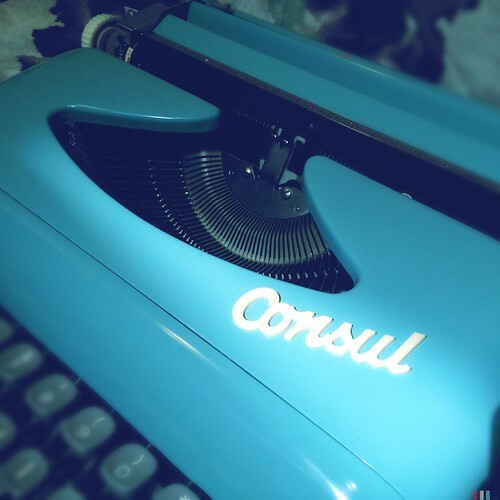 Maybe more bits and pieces of my strange writing process and experience will trickle down into this blog, but let's get back to the Consul 232. Yes, it was an "anger" purchase from a lost auction, but I do like the thing. It is in good to great condition. It is very... how do I say this... womanly? The color of course leans that way I think, but it's also very delicate and possesses beautiful curves. It's very compact with a bottom panel which I like so I can type on my lap. The carriage is extremely light. I don't know if it's specific to this model or just to this machine. It's almost disturbingly too light for me because I don't feel any weight with the lever and fear I may swing it too hard to the right and damage the thing. Is it fragile? I'm not sure yet, but it isn't sturdy like the Royals and the Rocket. The keys and the touch is very light. I was very surprised how light it was, but unfortunately it uses carriage shift. Wicked heavy! But let me say, I've discovered I have a very weak or lazy left pinky (or both). Here's where complete research could've saved me some money. I had read on Will Davis' site that Consul were early adaptors of basket shift for their portables so I jumped at the chance for this machine. But since I do not necessarily read in chronological order and finish reading everything completely, I didn't catch the later part where he points out that the ultra portables, which I call the laptops over the desktop portables, used a carriage shift. I only read that after I won the auction as the poor student I am! The keys are made of a light plastic with a wrinkles on the surface. I prefer smooth keytops. The alignment is straight and I do prefer a 12 pitch size. It has, however, a rather high pitched clack which I'm not a fan of. It isn't as bad as my Olympia SM 7 which literally pierces my eardrum. However, I'm starting to suspect the cause of such high pitchiness from a hardening platen. Please let me know if my hunch is correct. Here's a comparison of the Consul next to my weathered Royal Quiet de Luxe. The b/w for the design lines and color, well... for color! The blue really pops, doesn't it? His name is Rusty. She's not named yet. Here's a close up with Garbo soft lighting and another for moodiness. There you go, maybe I'll name her Garbo! Very nice photos. "Garbo" sure is curvy. Yes, a hard platen will cause noisy typing. You can try using one or two backing sheets of paper if springing for a recovered platen is too much. Thanks, I will try that. It's really nice to have you experts guide us newbies along! I have 232 too. Dual color version, main part blue and carriange and removable part in light blue. Because I'm from the Czech Republic, It costs me equivalently to 8 dollars, I admit I was lucky and get it cheap. 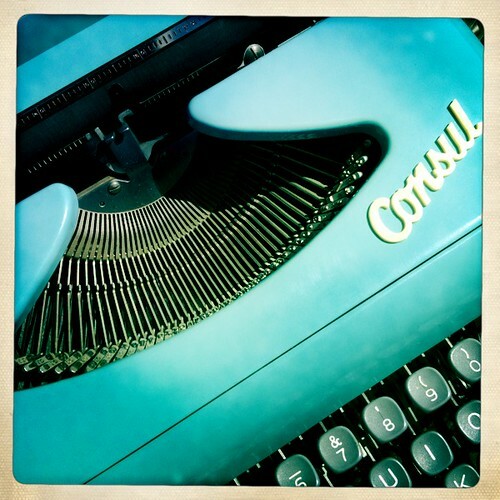 Half of typewriters in Czech are Consuls, they were made here. I was surprised by its weight, but i must say that it is best portable writer I ever try.